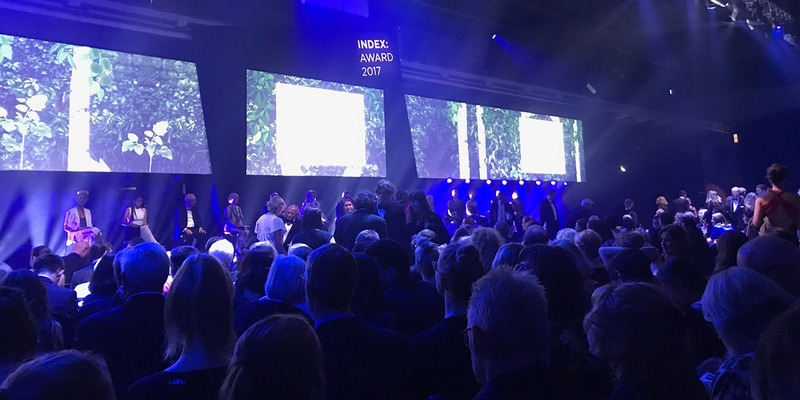 On Friday night, Team CanopyLAB were invited to INDEX Award 2017, an event celebrating designs that improve life. In late March earlier this year, we shared with you that we had been nominated for INDEX Award 2017 in the category Play and Learning. On Friday night, we had the pleasure to attend the award show, hosted at the Cultural Harbor in Helsingør. In between those two events, a jury of 14 experts had cut down the nominees to 56 finalists, ranging from drones delivering blood with parachutes to ways of beaming energy across the globe using satellites. Unfortunately, CanopyLAB were not among the finalist, but it was an exciting and inspirational evening nonetheless. During the evening, we witnessed the premiere of an inspiring movie about INDEX: Design to Improve Life by award winning filmmaker, Michelle Bauer Carpenter, highlighting the need for designs that addresses the most imminent challenges of the world and the idea behind INDEX. An idea that was described using the example of the multiple designs of white tea cups: the world simply has enough white tea cups — instead of designing yet another one, the idea is to inspire to design solutions that improve the life of people. The winners in the five categories, “Work”, “Play and Learning”, “Home”, “Body”, and “Community” were: GreenWave, a revolutionary ocean farming system designed to restore ocean ecosystems, mitigate climate change, and create jobs for fishermen — while providing healthy local food for communities; Paperfuge, a 20-cent hand-powered centrifuge made from simple household materials. It works just like a traditional centrifuge and can spin biological samples at thousands of revolutions per minute — a critical step in disease diagnosis; what3words, a revolutionary addressing system that has divided the world into 57 trillion 3×3 squares and assigned each with three unique words. It’s designed to put everyone on the map to ensure they’re recognized, identified, and found; Zipline, the world’s first commercial drone delivery system designed to get critical medical supplies, such as blood and vaccines, to where they’re needed fast. The initiative aims to put every single one of Rwanda’s 12 million citizens within a 15–35 minute delivery range of any essential medical product; and Ethereum, a world-changing technology that represents nothing less than the second generation of the Internet. It holds the potential to transform law, governance, finance, trade, and social organization, by removing the middlemen for global transactions and putting people back in control of their own data. Finally, Labster, a virtual reality lab providing high-quality immerse scientific lessons, received the People’s Choice Award. As we wrote in our last post, INDEX Award is the biggest and most prestigious design award in the world, often referred to as the “Nobel Prize of design”. While we were not among the finalist, we had a fun evening, where we got to hang out as a team, meet colleagues, and friends, and see the work of some amazing and inspiring people, sharing our vision of making a change for people around the world. We look forward to next year, perhaps (and hopefully) as finalists.